For group sales or other information, call (216) 932-3396. *The Tudor House a 100-year old structure without central air conditioning. Please consider dressing lightly. *Due to other limitations of this site-specific venue, there is no handicapped access for this production. *This show contains adult language. In Down by Contact, a down-and-out retired quarterback must decide between his allegiance to his former teammates and his love for his family. Struggling with the debilitating brain disease CTE, he tries to save the last vestige of his glory days: his lavish home. The lives of retired players and their families inspire the events of this new site-specific play, produced in Gilmour Academy’s stately Tudor House. Les Hunter’s plays have received over 40 productions across the country. He was a finalist for the Jewish Plays Project 2016 international Jewish Playwriting Contest for his play To the Orchard (Playwrights Local). He wrote for all three parts of the Off-Broadway hit, The Jackson Heights Trilogy (Theatre 167). His play Weimar was commissioned and produced by Baldwin Wallace University in 2018. Playscripts, Indie Theatre, and Brooklyn Publishers publish his plays. His articles have appeared in American Theatre Magazine, HowlRound, and The Dramatist, and his chapters in the books Performing the Progressive Era and Experimental O’Neill. He is the Ohio Regional Representative for the Dramatists Guild of America, past Curator of New Plays at LaGuardia Performing Arts Center in NYC, a member of the Playwrights GYM at Dobama Theatre, and on the Board of Directors of Playwrights Local. He’s held residences at Millikan University and Ora Lerman, and was a participant in the Mellon School of Theater and Performance Theory at Harvard University. He is an assistant professor of English at Baldwin Wallace. PhD: Stony Brook University, MFA: Boston University. Dale Heinen is a director and dramaturge who has worked on new plays in Cleveland, Chicago, Glasgow, London, New York City, Dublin, Tokyo, and Brazil. For several years she was a dramaturge for Soho Theatre in London’s West End, and prior to that was co-Artistic Director of an equity off-Loop theatre in Chicago, during which time critics selected her three times as one of Chicago’s “Best Directors” in the trade paper PerformInk. Dale has directed over thirty productions; her work has been recognized by the Jeff Awards and by the After Dark Awards (Chicago), and she was the recipient of the Arches Award for Directors (Glasgow). Since returning to her hometown of Cleveland, she has directed new work at Cleveland Public Theatre, Lake Erie College, Dobama Theatre, and Playwrights Local, where she is a company member. Dale teaches at John Carroll University in Cleveland and has a BA from Northwestern University (Evanston, IL) and an MFA in theatre directing from Middlesex University (London). In 2015, Dale co-founded BorderLight: the Festival of International Theatre, Cleveland. BorderLight (www.borderlightcle.org) will launch in late summer 2019 in downtown Cleveland. 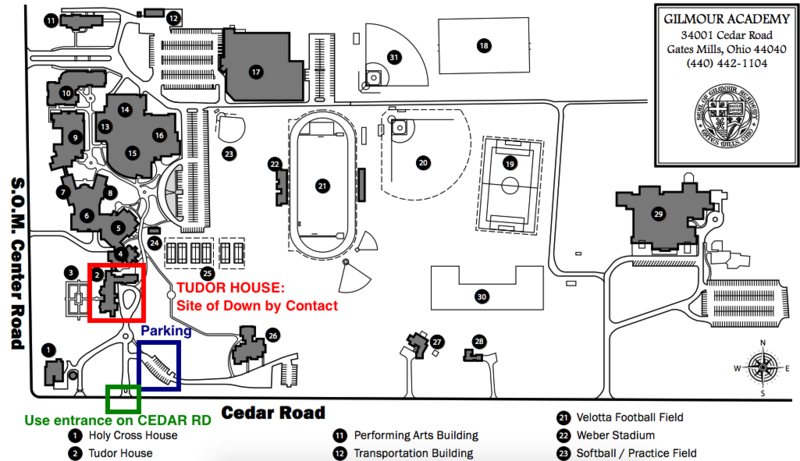 Use the Cedar Road entrance to Gilmour Academy to find the Tudor (Admissions) House. Parking is in the lot that is north of Cedar Road, just off (to the right of) the driveway on the south side of the Tudor House. Parking is not permitted around the Tudor Circle. Please note that using a mapping application on your phone or computer with the address “34001 Cedar Road” may incorrectly send you to the SOM Center Road entrance. Be sure to use Cedar Road entrance.